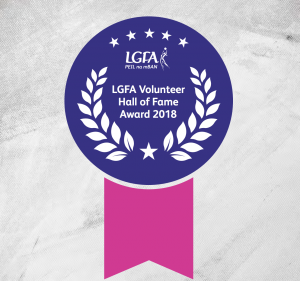 The LGFA has also announced a new category for 2018 – the Volunteer Hall of Fame award. 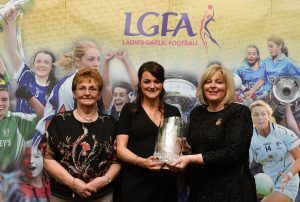 The inaugural LGFA Volunteer of the Year awards were held at Croke Park on February 17 last and, in addition to the Volunteer Hall of Fame award, the scheme will once again recognise winners from 2018 in the following categories. Sheena Byrne, from Kilcock, Co Kildare, is presented with the Lulu Carroll Award as the Overall Volunteer of the Year Award Winner by Ladies Gaelic Football Association President Marie Hickey and Angela Carroll, mother of the late Lulu Carroll. 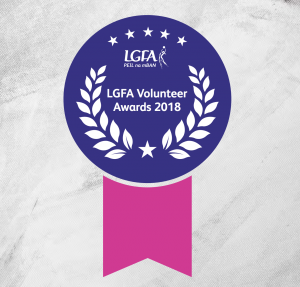 The Committee Officer, Youth Volunteer, School Coach, PRO, Local Journalist and Overall Volunteer of the Year awards will be chosen on receipt of applications to info@lgfa.ie by Friday, December 21. The Club Coach of the Year award is a little different, as applications will once again be sought by posting to our Facebook and Twitter pages, using the hashtag #ThanksCoach by Friday, December 21. “International Volunteer Day on December 5 is fast approaching and it’s a good time to announce that we are once again recognising the many volunteers who undertake sterling and selfless work in their local communities on behalf of our Association. “The inaugural Volunteer of the Year awards night proved to be a resounding success and was very well received.